This is what greeted me soon as I got to Azta Urban Salon. They had a photo of me and they personalized it with my name, blog url, as well as the treatment that I was getting. It was really a nice touch and one that I deeply appreciate. Even though Azta is famous for their hair color sessions, they agreed to let me have a digital perm because I have never ever colored my hair. I really appreciated that about them. First thing they did was do a consultation of my hair. They asked me questions about when was the last time I had treatments, rebonding, and the like. They were very happy that my hair was apparently what they would call a virgin which makes the digiperm perfect. Here is my before picture. As you can see, my hair is very straight. I've had this hairstyle for almost 20 years. I figured, after so many badgering from friends, that it was time for a change. We started with shampoo. One unique thing about Azta is that they actually shampoo your hair while you're seated in front of the mirror. You don't need to go to the wash area for this. Afterwards, they wash it off. They then layered my hair to give the curls more body. Here I am with Mr. Jo. Tubato, senior stylist of Azta Urban Salon. When he asked me how I wanted to go about my hair, I said that I trusted his judgement completely which made him really happy. I guess few people do that nowadays but I figured he has to be a senior stylist for a reason. Afterwards, April, the Junior Stylist dried my hair. They had to ensure that my hair was completely dry because I had virgin hair. 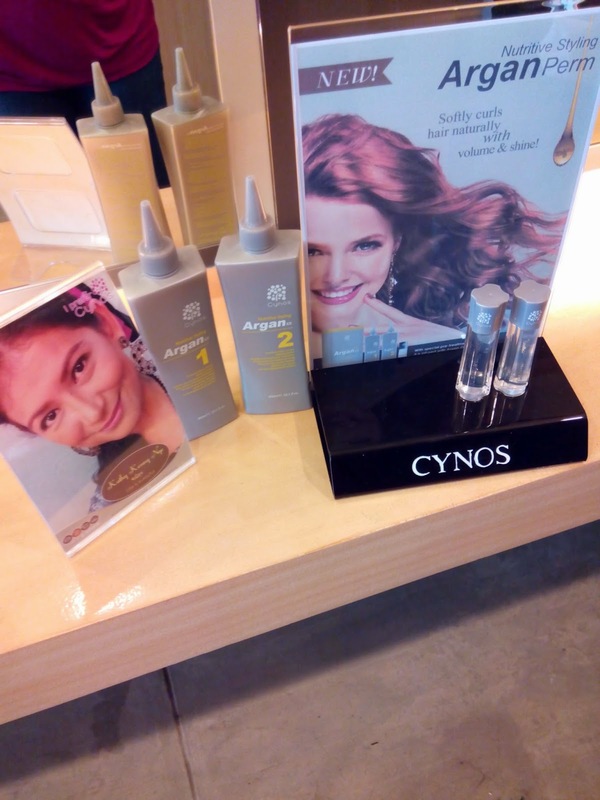 They then place the Cynos Argan Nutritive Styling that breaks down the chemical in my hair to prepare it for being permed. 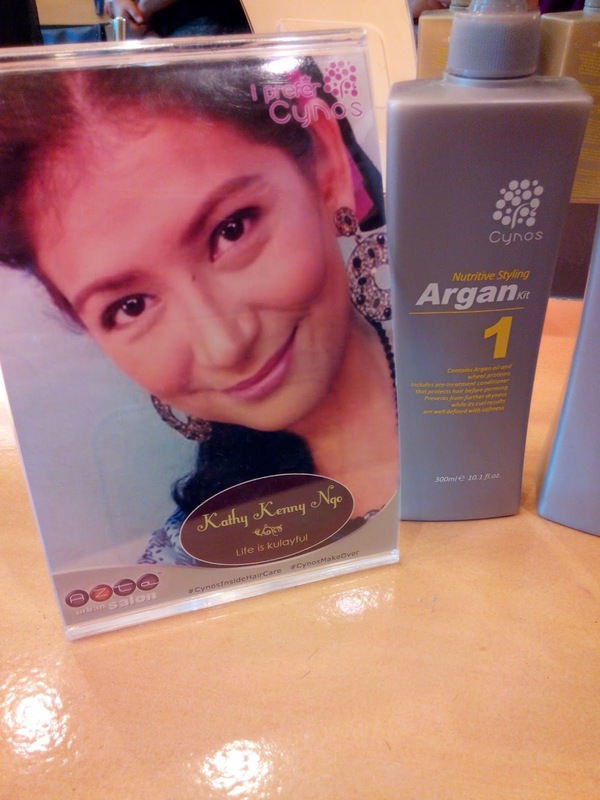 Afterwards, they place the Number 2 Argan Nutritive Styling Kit which will then perm the hair permanently. This is the machine that they use to do the digiperm. It looks scary but its actually not. There is a slight discomfort because you can feel the heat on your nape but if tilt your head a little bit, the discomfort goes away. The last step is a liquid being placed on your hair to set everything in and then moisturize the hair to ensure it wouldn't dry up. I love how my hair turned out. It was exactly what I wanted not to mention the fabulous service provided by Azta Urban Salon. I felt so pampered and so relaxed. It was a first for me to just completely trust an entire staff with my hair but I am glad that I did. I also love the fact that they use only the top of the line products for their hair treatments which is Cynos Inside Hair Care. My hair remains soft and manageable till now. For more information on the DigiPerm Treatment that I had and what they used, here you go. They did a great hair makeover. It's also cool that they shampoo you in your seat as you get to appreciate the process better. How long did your curls last? Where is this SM Jazz? How much is their service charge for this? You are right though, the machine looks scary. You look great with curly hair! It's nice of Azta Urban Salon to personalize your place there ha. Do they do that to other customers with reservation too?